Woodruff Butte is a volcanic cinder cone that is known as Tsimontukwi to the Hopi. It is one of nine major pilgrimage shrines that encircle Hopi traditional territory, and was for many years the site of nine clan shrines, until eight were destroyed by mining. Hopis visited the butte to offer prayer feathers and to pray for rain, to collect plants and medicines, and to gather golden eagles for their Home Dance ceremony. The butte is also a site of pilgrimage and prayer for the Zuni people, and marks the boundary of spiritual responsibility between Hopi and Zuni territory. One Hopi clan’s shrines were destroyed in the 1960s when a radio tower was erected near the top of Woodruff Butte. In 1990, the butte’s owner contracted to open a gravel mine to supply asphalt for the re-paving of Interstate 40 and, after hearing of Hopi protests, he offered to sell the property to the tribe for $1 million. This amount was impossible for the Hopi, most of whom did not want to commodify or buy a sacred site, and the quarrying continued. 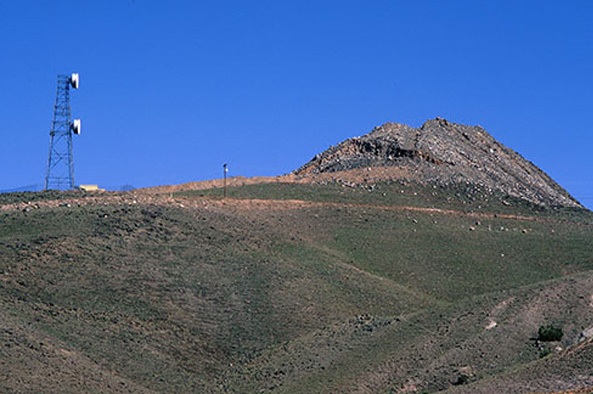 When the present owner bought the butte in 1996, he raised the asking price to $3 million. The Hopi tried to use the National Historic Preservation Act to prevent the destruction, arguing that because the gravel was coming from a site eligible for the National Register of Historic Places, the butte should not be damaged for federal highway construction. In 1998, a judge agreed and issued a temporary injunction and stopped the mining, pending a cultural resources inventory. Inexplicably, the archaeologist responsible for the survey failed to note the shrines and mining resumed. As depicted in the film, In the Light of Reverence, mining for gravel continues at Woodruff Butte. Almost all of the Hopi clan shrines have been destroyed, as well as the entire top of the butte. Eagle nests were also destroyed. One worker in the midst of the bulldozing said to Leigh Kuwanwisiwma, the cultural preservation officer for the Hopi Tribe, that they had put a fence around one shrine, so the Hopi could still pray there. This comment highlights one of the fundamental misunderstandings about sacred landscapes: destroying part of an important place causes the whole area to lose its integrity and its spiritual significance. Kuwanwisiwma compares the mining to “the Hopi going into Woodruff [the largely Mormon town nearby] and bulldozing part of the Mormon church.” While other sites on public land may profit from historic preservation or environmental laws, the Hopi have extremely limited options in a case like this where the sacred sites are on private property. Even if the Hopi were able to raise the several million dollars requested by the owner, there are deep questions within the tribe about the ethics of purchasing a sacred site. The situation at Woodruff Butte highlights the inadequacy of the American Indian Religious Freedom Act, which does not protect land, and the National Historic Preservation Act, which does not give a tribe power to influence what happens to a site on private property. Endangered sacred sites around the country prove the need to amend AIRFA or pass another statute protecting Native American sacred places.